My first storm chase of 2017. Turned out to be a pretty interesting day. 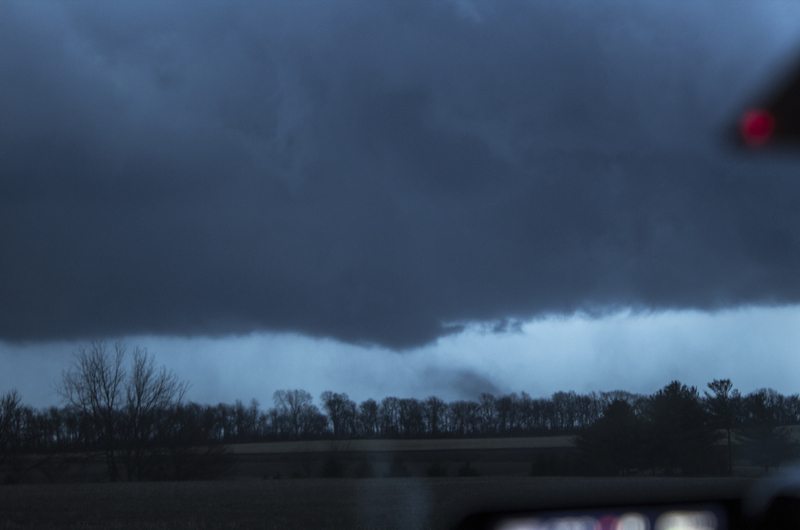 It was the farther north tornadoes have ever been reported in February in Illinois, and had the strongest tornadoes ever reported in February in the Chicago NWS’s county warning area. I stayed at work a little late that day, thinking I might head south during my chase. It ended looking like all the action would be to the north of Peoria, so I headed back to my apartment. I was only there for about ten minutes when the storms firing to my north started looking interesting. So I hit the road, heading to Brimfield. I got to Brimfield with every intention of stopping, but I couldn’t find anywhere to stop. The storm just to my north showed some rotation on radar, so I decided to head north and take a peak. It head a wall cloud briefly, but it eventually moved away and weakened. The storm farther north looked interesting, so I chased after that one. At the same time, I was keeping my eye on a storm to my southwest which as already developing a hook echo. I caught up to that second storm, and then followed it east for a while. It eventually produced a funnel cloud, so I pulled over to observe it. Upon viewing my video of that funnel cloud, it appears that it may have touched down. After that, the southwestern storm began looking more and more impressive. I decided to head south to get ahead of it. My initial target was Chilicothe, but the storm was moving too fast. I headed to Lacon, crossed the Illinois River, and kept racing east. I never gained any distance on the storm, so I decided to head south and let the storm pass in front of me. I rain into the hail core a couple of times during this process. Eventually, the storm passed in front of me, and I chased after it. 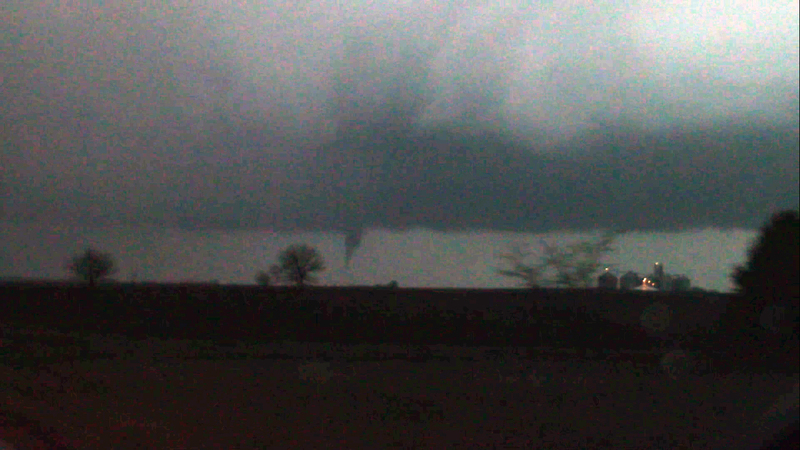 As I began entering Toluca, I saw a tornado off to the front right. 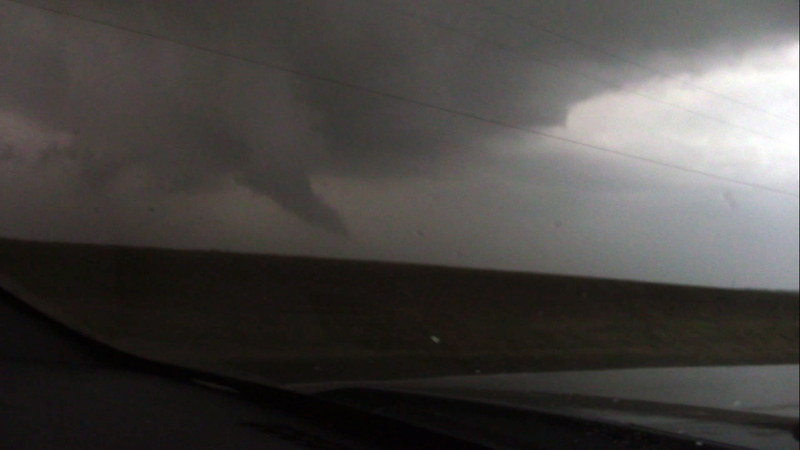 This was the Washburn tornado, and it seemed to be dissipating at this point. I continued east through Toluca. The Washburn, Illinois tornado, as seen from Toluca, Illinois. As I got near Rutland, I saw a thin rope tornado touch down. The condescension funnel seemed to lift and touch back down repeated; although I could see the dust swirl on the ground. Unfortunately, the road I was on ended, and I had to turn around and find a new route through town. Eventually, I got east of the town and caught up to the storm. I didn’t see the tornado initially, but I did see it a few minutes later. I believe it was a different tornado at this point. I followed it for a while, but it eventually faded from view. It was pretty much dark at this point, so I called it a night. This was a challenging chase, partially because of how fast the storms were moving, and partially because of computer programs. When I was in my car, about to leave my apartment and getting my computer set up, it died on me. It died a few more times after that, as well. Not only that, my USB GPS decided to not work. I even tried using my back up one, with no luck. So I was mainly relying on my cell phone for this chase.